At Flick’s we are deeply interested in the alcoholic beverages we sell. If we didn’t have passion for this work it might be difficult to maintain such a high level of commitment, but luckily we are fully invested in finding the greatest products out there, both to provide our customers with fine wares and to feed our own interest in the items we sell. If you’re as interested in alcohol as we are, you should know that beyond our beverage and grocery sections Flick’s stocks a wide variety of supplies, including many alcohol-related accessories. Sometimes just having a simple drink is enough, but if you’ve ever been to a bar and wished you could recreate the more complex concoctions you found there at home, then we’re happy to say that doing so is entirely within your grasp. 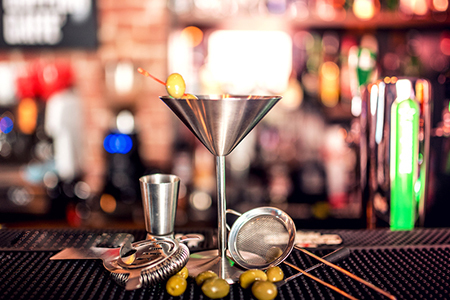 Here at Flick’s we stock a great many items which can help you establish a proper bar, allowing you to have just about every options you’d have at a professional establishment within the comfort of your own home. Of course, the key component of an excellent bar is a fine collection of liquors, and we certainly have you covered on that front, but we also carry many tools which can help expand your range of options. We carry simple things like can/bottle openers, easy to use corkscrews, many types of glasses, coasters, pitchers and ice buckets, but also stock more advanced options like stir-stix, shakers, pourers and stoppers. We also stock mixers, garnishes, condiments and other important additions that help make a drink feel truly special. We even stock playing cards, dice and poker chips so that you can have a little entertainment. Don’t know any recipes? That’s not a problem, as we stock bartending guides and recipe books as well. Here at Flick’s we carry just about everything you’ll need to create a great bar in your home. So if you want to take your drinking experience to the next level, come in today and grab some supplies. Having your own bar opens up great opportunities for socialization and they can greatly enhance parties and social calls of all kinds. Plus, sometimes you just don’t feel like going out. Come to Flick’s and let us help you design your perfect bar today.